With an eddy of leaves trailing behind them, Carmen and Lupita Andrade take off in their father's old truck, a couple of high school girls learning to drive. They move in a herky-jerky motion around their backyard with their father, Victor, offering a bit of coaching in Spanish as they make their way past the chicken coop and back and forth across the bumpy yard. "The reason I want to get my license is to be more independent," Carmen says, "so I won't have to rely so much on my parents." In the waning mid-October afternoon sunlight, it could be just another teenage driving lesson, but Carmen and Lupita are far from ordinary 16-year-olds. 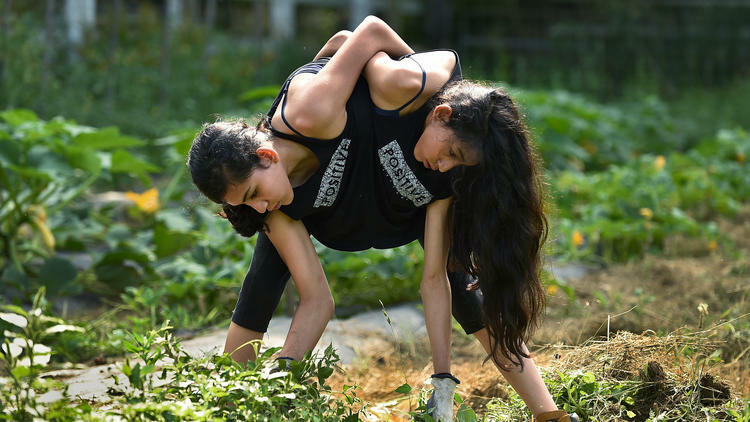 The girls are among the country's very few sets of conjoined twins. They are attached along their chest walls down to their pelvis where their spines meet. They each have two arms, but only a single leg, with Carmen controlling the right and Lupita, the left. Only Carmen, who tends to be the more assertive and outspoken of the two, is really interested in getting her license, so she sits in the driver's seat with both hands on the wheel and her right foot — the one she controls — working the pedals. Lupita, who is squeezed between Carmen and the driver's door, doesn't see any reason to get a license if her sister has hers. Bound together inextricably — with every movement demanding extraordinary coordination and cooperation — they wouldn't have it any other way at this point. "We're so dependent on each other," explains Lupita, who doubts they could "get used to not being dependent on each other." Most of the time, Carmen and Lupita are absorbed in teenage priorities like schoolwork and friends, but more daunting questions lie along the road ahead. In a world that instantly sees them as different, Carmen and Lupita face imposing challenges that aren't nearly so visible. Serious medical issues could one day mean delicate surgery or an oxygen tank for Lupita, whose curved spine is cramping her lungs. The girls also face fears that their family, who came from Mexico seeking medical attention for them when they were babies, might be forced to leave the U.S. if President Donald Trump does away with the work permit program that has allowed them to stay. The girls each have a heart, a set of arms, a set of lungs and a stomach, but they share some ribs, a liver, their circulatory system, and their digestive and reproductive systems. Years ago, they spent long hours in physical therapy, learning how to get up off their backs and sit and use their legs together. At the age of 4, they took their first steps. When they were tiny, doctors considered separating them, but concluded it couldn't be done safely. They have learned to balance and coordinate every move, bracing themselves at times to offset the strain of supporting two upper bodies on one set of hips and one pair of legs. Theirs is a life lived in tandem that is so practiced, the girls say it's instinct now. When they are in a cafeteria, one will reach for lunch and it's almost always just what the other wants too; in the evening when they choose an outfit for school the next day, they seldom differ on what to wear. "We kind of, like, have to agree," Carmen says. "It's obvious." Their mother, Norma Solis, buys two of the same tops, dresses and coats, and then has a friend sew them together, tailoring them to fit. Often, they finish each others' sentences. Describing how they handle the insensitive comments of strangers, Carmen said, "So if somebody asks us, like, if we're twins, either I or mostly Lupita would just respond ...."
"No, we're really close cousins," Lupita says. But the twins also have markedly distinct personalities. Carmen is a strong student, witty, sharp-tongued and ambitious. Lupita is quieter, has trouble with reading comprehension and takes modified versions of tests, but like her sister can be quick with a pointed, often humorous remark. "A lot of people don't notice, like, because when they first meet us, we kind of have the same reactions …," said Carmen. "But our friends, once they get to know us, our friends literally tell us, 'You guys are so completely different,' and I'm like, 'Well, yeah. We're two different people.'" The girls do find ways to assert their own identities. Carmen often wears make-up, applying eyeliner and mascara, while Lupita usually can't be bothered. And they may not be in the mood for the same music. "If we are listening to alternative rock," Carmen says. "Maybe I want to listen to [the group] Panic! at the Disco or she wants to listen to Fall Out Boy." If she needs time alone, Lupita will go on their cellphone or computer; Carmen will stay up late scrolling through social media on the phone while her sister sleeps beside her. Day to day, the twins' dreams and concerns are like those of any teenager. They talk about midterms, school projects that need to be completed, the SATs, friends, getting their learner's permit to drive, practicing the piano. They have a list of colleges they are interested in, including the State University of New York at Cobleskill and Unity College in Maine. One day Carmen would like to get a car, a big Chevy Silverado, she says, or a Ford F-150 to drive around the state and visit friends. "You may look different but you still try to be like everyone else," she explains. 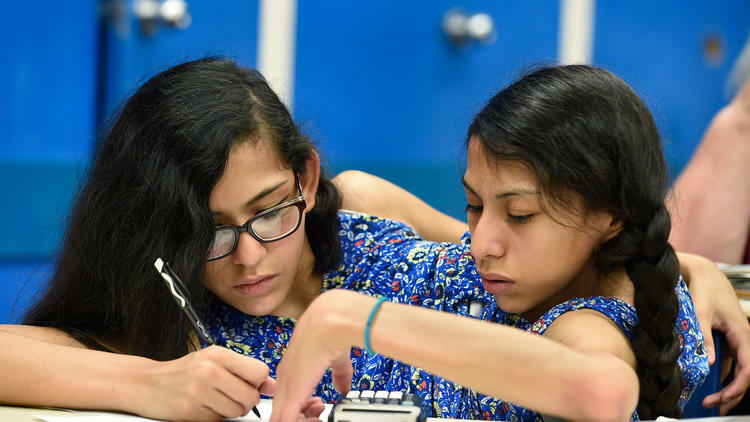 On a warm day last fall, Carmen and Lupita blazed through the halls of Nonnewaug High School, pulling a wheeled backpack behind them and outpacing many students as they raced from the academic end of the high school to the agricultural wing where their passions lie. "Ag is our safe haven from school, basically," Carmen says about the agricultural program at Nonnewaug. They hope to have a career as veterinarians or in some aspect of animal husbandry. "We learn a lot but we still get to get a lot of hands-on experience. We wouldn't just look at a picture of a cow … We actually touch them." Both girls say they prefer animals to people in many ways. "They don't talk," Lupita explains. "They know what you're feeling because they get [it] off of your vibes." Animals don't ask questions or raise more issues than either sister wants to think about. 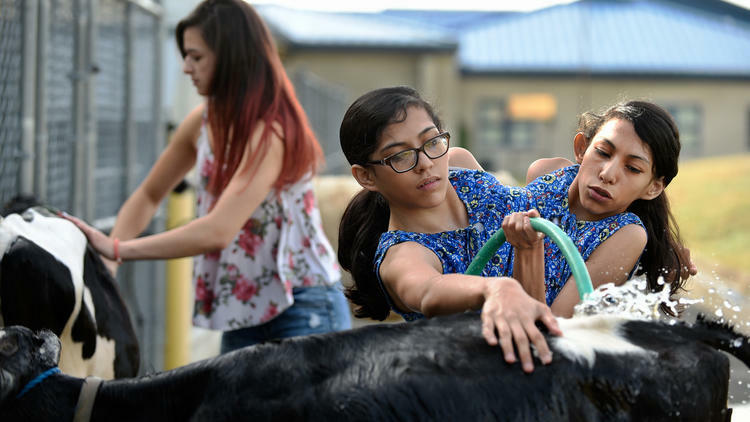 "It's more therapeutic than actually talking it out with a counselor or things like that," Carmen said of working with farm animals. "I guess because they don't speak," she said, or ask "how do you feel about that?" Carmen and Lupita came to Nonnewaug from New Milford for the agricultural program. As a way to prepare students and staff for them at Nonnewaug, the girls, with the help of a New Milford school counselor, made a video explaining who they are. "They wanted students to be familiar with who we were," Carmen said, "so they wouldn't be surprised when we came to school." Bill Davenport, a teacher at Nonnewaug, said he recalls being a bit flustered when he met with the girls to interview them for the agricultural program. "When you meet them for the first time, it's a very new experience," Davenport said. "All these questions are running through my head and the science part of me is like: How does this work ? One controls one leg and one controls the other? It blows your mind." "But the second you start talking to them and see them interacting with everyone else, you don't even think there is anything different …. Just two teenage girls that share legs, seriously." In a small examining room at Connecticut Children's Medical Center last summer, Dr. Mark Lee described to the girls and their mother the pros and cons of possible surgery — an operation that might straighten Lupita's spine and improve her breathing. Lupita's lungs are functioning at only 40 percent of capacity. If Carmen catches a cold, she recovers quickly, but if she passes it to Lupita it could land them in the hospital. When Lupita has trouble breathing, Carmen finds herself breathing harder to compensate. Lee tells them that Lupita's curve is "very, very severe" and the typical approach to such scoliosis is to take out a segment of the spine to correct the malformation. He would use the same approach with the twins, but "the complications are clear," Lee told them. "We've never operated on conjoined twins who have scoliosis." There are certain considerations as to how this will impact Lupita and Carmen's function. Surgeons don't have much experience operating on conjoined twins because there are so few of them. Their incidence is extremely rare with an estimated one in 200,000 live births of conjoined twins. Most conjoined twins are still born or die shortly after birth. Conjoined twins are formed when a single fertilized egg starts to split into identical twins soon after conception but stops before the process is completed. The chance that the twins can be separated depends on when the egg stopped splitting. If early on, the babies may share many organs; if later they are likely to have fewer shared systems and separation would be easier. Their mother remembers clearly when she learned she was carrying conjoined twins. She had gone to the hospital in her home city of Veracruz in December 1999 and was told that at 13 weeks pregnant, she was carrying twins that appeared to be growing normally. "In my family that was fairly normal," Solis said. "My mom had twins." There were also twins in her husband, Victor's family. But the next month when she went back to the clinic, she noticed that the doctor was taking a very long time on the ultrasound. "Did you come alone?" he asked her. When the twins were born in June 2000, Solis and her husband were told the girls would only live for three days. But the girls thrived and their parents explored separating them. Doctors in Mexico told them it wasn't possible because of their shared organs. With the help of an organization in Connecticut called Healing the Children, Solis brought the girls to the U.S. as 1-year-old babies to see if they could be separated. The news here wasn't any better. Last summer, the girls and their mother listened quietly as Lee told them that the scoliosis surgery was very risky. "The worst-case scenario is that you die from the surgery and that's a possibility," he said. "Short of losing your life, you can lose neurologic function. If you lose neurologic function and one or both legs don't work, you'll know about it right away." Lee said doctors expect Lupita's scoliosis to continue to worsen and affect her lungs. "You know you are looking at essentially maybe needing oxygen going forward and sometimes it can also shorten your lifespan," Lee told them. Lee urged the girls to weigh their options because of the risks. "It's something we don't do every day," he said. "... and you really have to consider the potential benefits and the harm you would be putting yourself through." On a day last fall, the girls' English teacher was describing an assignment to the class, and noted that if they wanted to, they could tackle parts of an assignment separately. "You know we can't be separated," Carmen quipped, to appreciative laughter around her. At Nonnewaug, the girls are known for their humor, often willing to poke fun at themselves. 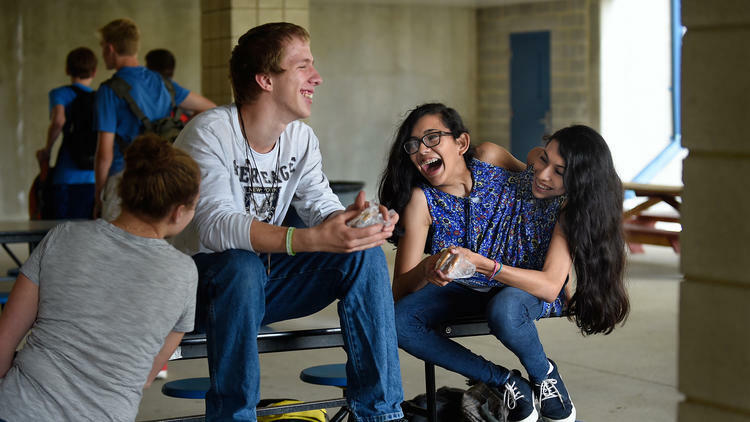 "[Carmen] gives it right back, once you get her going," Joe Kimberly, a junior and a longtime friend says one day after bantering with the girls in the cafeteria. "Lupita is a little more shy 'til you get to know her. Given the day, one may be a little more up in your face than the other…You know how it is. They don't take nothing!" The girls have also spoken up at demonstrations and at legislative hearings in favor of allowing state colleges and universities to provide financial aid to students who are undocumented immigrants or who, like the twins, don't have eligible immigration status. The girls are also not afraid to voice their views to peers. When some kids were passing judgment on a transgender girl, Carmen recalls, "I'm like, well it's not your choice to make because you don't understand what she's going through ... And they are like, 'How do you know?' Well, I'm not transgender but I know what it's like to be different." The twins also know what it's like to be gawked at or to be subjected to unkind remarks while out in public where people don't know them. Carmen has sassy responses ready for anyone who stares too hard or is rude. "I tell them we're a science experiment that went terribly wrong," she said. Or to the teenager who asked her: "Are you from another planet?" she answered, "Yes, New Milford." Others will simply say, "God Bless," maybe out of pity, Carmen guesses. And there are some who thrust dollars in their hands. "Apparently we're a charity," Carmen says dryly. She always tries to give the money back but sometimes people won't take it. The twins realize that most of the misguided comments that people make — "Are y'all stuck together?" — are not born of malice. "We can't just despise the world," Carmen said, "so I guess we just have to come to an understanding of that fact that people who are going to ask questions are either…" Carmen is interrupted by Lupita, who finishes her thought. "They are either really ignorant, or they don't understand." On a warm sunny afternoon the twins sat on a garden bench in their back yard and considered a hypothetical question: If they could safely be separated would they want to be? Lupita says no quickly and Carmen reflects that separation would leave them with just one leg each and, even if it went well, would mean years of physical therapy to rehabilitate themselves and perhaps less overall mobility. "And then there's the whole psychological situation," Carmen said, "because we've been so used to, like, being together. I don't think there'd be, like, a point." As the girls talk, Carmen's right hand and Lupita's left, do their own communicating, as they so often do — clasping each other, interlacing fingers, gripping, stroking and swiping their palms together. At one point Lupita cracks Carmen's knuckles. And if they were separated, Carmen continued, she wouldn't be able to help Lupita as much with her reading. "They wouldn't really let me," she said. But more importantly, she said, "There's been a person there for, like, my whole life, listening about my crap ... I guess [there's] an emotional attachment to my sister." Finally the conversation turns to whether the girls will pursue the surgery that might make it easier for Lupita to breathe. "There's a lot more risk to it then it actually being beneficial so we..." Carmen begins. "... decided not to," Lupita says. "We're just going to live out life and that's it."